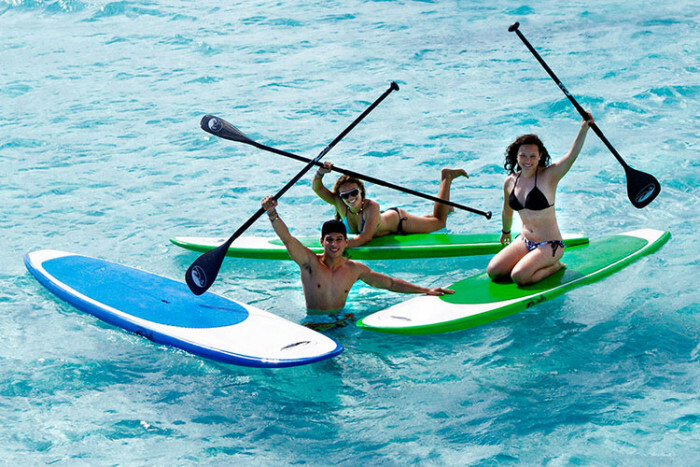 Cozumel is the ideal place to try this exciting new activity! 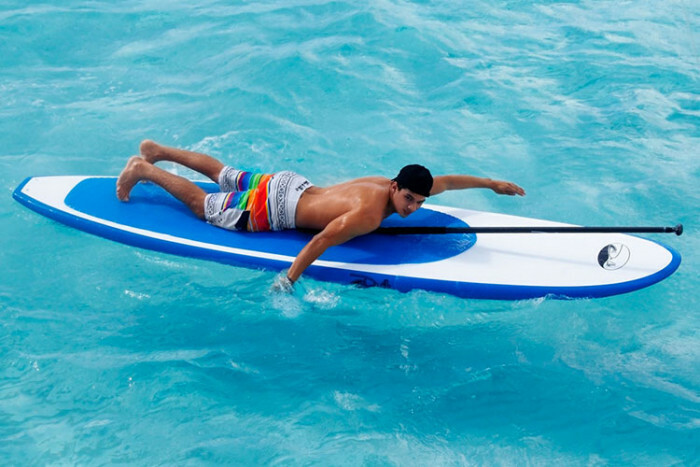 Find out why the world is going crazy about stand up paddleboarding with a safe, professional introduction to the sport. 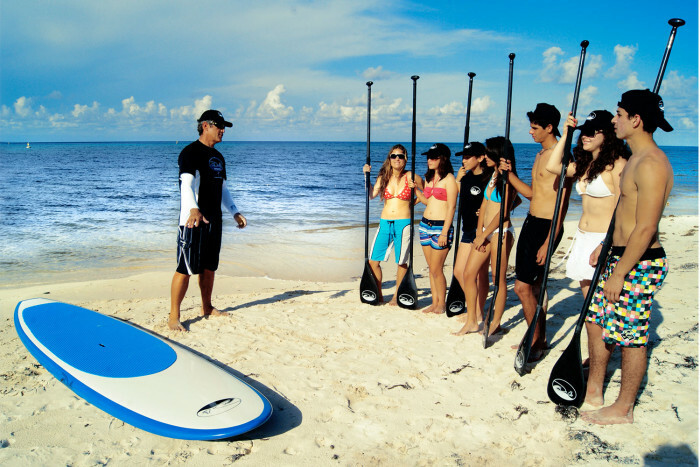 You'll be using state of the art equipment and will have personal instruction in a small group from a qualified Cozumel SUP instructor. Your friendly, English-speaking instructor will soon have you up on your board and paddling calm waters along the island's coastline. Within seconds you'll be hooked and will quickly understand why this fast-growing sport is becoming so popular all around the world. Not only is it a fantastic way see beautiful Caribbean scenery, it also offers a great way to work out without needing to over exhert yourself. 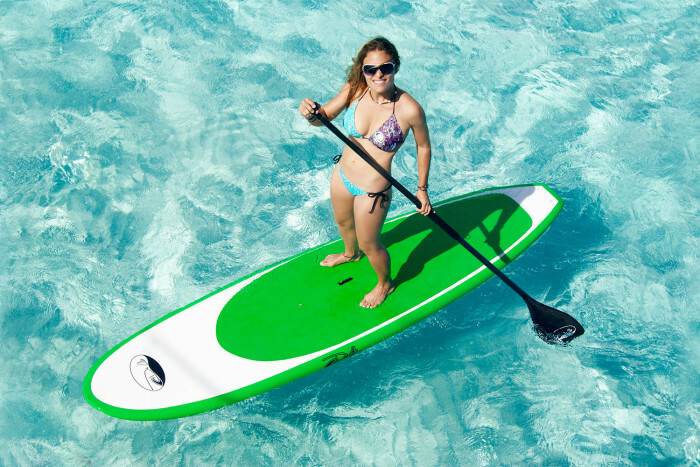 This Cozumel SUP introduction truly is an unmissable opportunity and will be the highlight of your vacation, get ready to tell all your friends about it when you get back home! 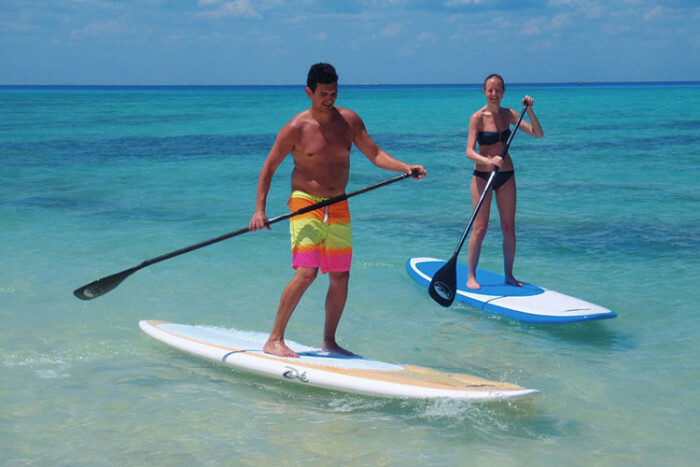 For experienced stand-up paddle boarders we also offer Cozumel SUP tours, contact us for more information. "Total must! It was out first time doing SUP and we were a bit nervous. The instructors were super patient and did not give up until we succeeded! If it's your first time or not, totally do it!" "A fantastic family event. 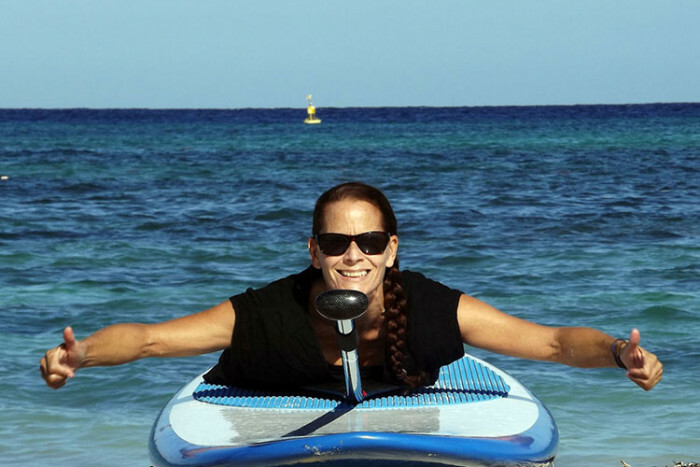 Never in a million years did I think that this 60 year old could actually stand up and paddle on a board, but I was up on the 3rd try and paddling on the 4th. Our granddaughters had a great time racing and hubby was also surprised that he was able to stand and paddle as quickly as he did. This was an adventure we would definitely enjoy again." 9.30am, 11am or 1pm, Mon-Sat. Other times may be available upon request. $60 per person (adults and children). 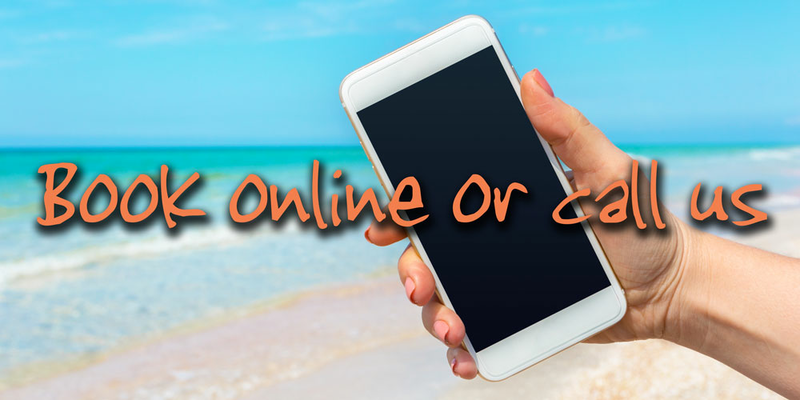 Towel, cap or hat, sun block, sun glasses, swimsuit, water shoes (optional but recommended) and camera. Professional introductory course in groups of 2-8 people; All equipment; Purified water. Transport to/from meeting point, optional gratuities. The meeting point is at the north end of the downtown oceanfront. If you arrive to the Puerta Maya pier (most Carnival and some others) the meeting point is a 5-10 minute taxi ride away, costing about $8-10. If you arrive to the International SSA (most Royal Caribbean and some others) pier the meeting point is a 5-10 minute taxi ride away, costing about $8-10. If you arrive to the Punta Langosta pier (most Norwegian and Disney and some others) the meeting point is about a 15-20 minute walk north along the oceanfront (keep the sea on your left), or a short taxi ride costing about $5. For guests staying downtown the meeting point is a short walk or taxi ride away. For guests staying in northern hotels the meeting point is a 10-15 minute taxi ride away, costing about $10-16. For guests staying in southern hotels the meeting point is a 20-45 minute taxi ride away, costing about $20-30. This tour is not suitable for pregnant women or people with back injuries, asthma, epilepsy or obesity. Minimum age to participate in this activity is 12 years.